On his 40th birthday Peter Svidler was in Almaty to play in the Eurasian Blitz Cup and gave an interview for the Kazakhstan edition of Esquire magazine. He talked about the life of a chess player, the phenomenon and likely consequences of the popularity of chess in Norway, and how he’s already beginning to think about what he might do when he can no longer play chess at the very highest level. What’s going on in the chess world? Nothing revolutionary. Everything’s pretty stable. The situation with popularising chess is healthy: there’s mass promotion of chess, particularly in schools. The internet gives an exceptional number of new options: online broadcasts, teaching. The potential chess audience is now much greater than when I began. Instead of Chess School with Averbakh (a popular program on Soviet TV from 1969-1988 - Esquire) there are now dozens of internet sites – all of that has gone online. When turning up to watch chess in person, someone who doesn’t really understand the nuances of the game will be baffled. There’s a lot of hidden intrigue, and a good commentator can explain it to a wide audience, but if there’s no commentator then two people thinking half an hour over each move is a boring spectacle. The internet makes that spectacle spectacular, accessible and understandable. Glamour also plays a role in popularising chess, but you can’t rely on it long-term. 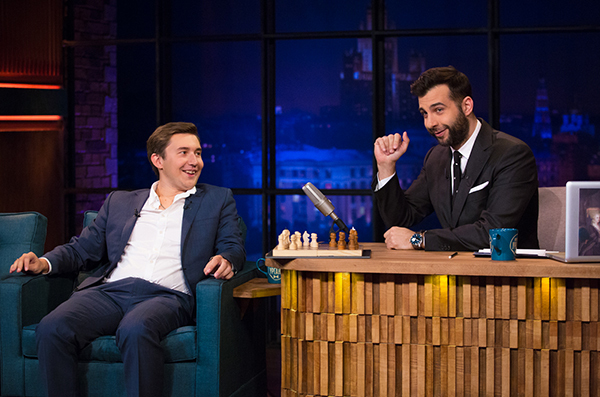 Yes, Russian chess players have now appeared twice on the Urgant show in the space of a few months, but that was connected to particular victories. That benefits chess, since people are no longer used to seeing chess players on TV. 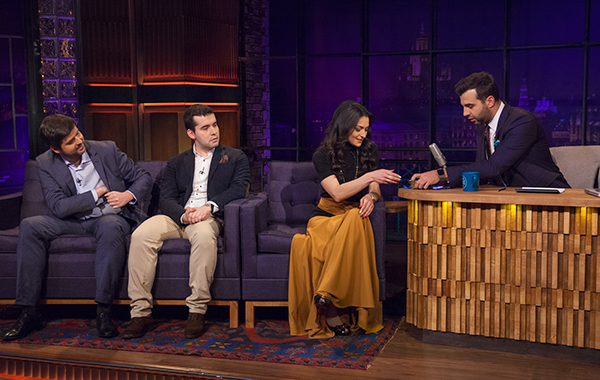 Genuine and serious broadcasting of chess tournaments on TV is only being done in one country in the world – Norway. The main channel there has live broadcasts of all the tournaments in which their compatriot and World Champion Magnus Carlsen is playing. He’s the no. 1 in the country in terms of popularity. What the Norwegians are doing is truly revolutionary, since even in Soviet times it was just a 10-minute clip on the programme Time, but they’re showing whole rounds. Half the country watches those broadcasts, which is simply unprecedented. Sometimes they show seven hours of chess live – there’s nothing like it anywhere else. The results of such popularisation will, I think, be seen by about 2025, but we’ll definitely see results. The most important event in history for the growth of chess was the match in Reykjavik between Fischer and Spassky. I know a lot of people who told me that if it wasn’t for that match they would never in their life have started to play the game. Those are people who’ve reached the top. They got into chess because of one event – the battle of a lone American against the Soviet machine. Chess is my life’s work. I’m supported by my family, but what does that support mean? It’s more a question of understanding. My wife and I have already been together for 15 years. We don’t always go to tournaments together - after all we have two children - but we sometimes manage. I don’t think I’m the worst husband and father. I’m happy that my sons don’t play chess. It would be tough for my children to play chess in St. Petersburg – they wouldn’t be anonymous kids and there would be serious pressure. Of course I showed them the pieces, familiarised them with the game and watched for their reaction. Neither one nor the other showed any great interest in the process. I didn’t insist. Chess isn’t the only way to help a child’s all-round development. They’re 14 years old and I’m happy with how they’re growing up. At the age of 14 myself, I was a dull, quiet boy who read books in the corner. Natives of St. Petersburg aren’t so concerned about the title of the country’s cultural capital. That’s used more as an insult than a serious idea, but I like both the city and its inhabitants. As for how cultured and like a capital we are, it’s better to judge from the outside. “Peter” has become cleaner and better equipped. It’s my city and I feel comfortable there. I take it as it is. How many hours I spend a day on chess depends on my state of mind. In that regard I’ve never been a workaholic. There are days when I don’t touch the pieces at all – mood, state of mind. I still read a great deal and omnivorously. More in English than in Russian. Soviet schooling takes away a love of the Russian classics, so it would do no harm to go through that program again from an adult perspective. As for modern Russian literature – I haven’t liked much that I’ve read. Therefore I read reams of foreign literature. On the plane I finished the final part of Margaret Atwood’s Oryx and Crake trilogy. I also still play with toys, games of various sorts, but it’s nothing essential. I can take it or leave it. In general, I spend time on a lot of nonsense – there’s plenty of nonsense to go around. I’m not planning to get involved in any way in the political life of my city or country, though I do hold positions on various questions. I’m not in favour of making declarations, though, because I only feel comfortable speaking about those matters where I understand something. There aren’t many such areas in life. I have an opinion but, realising its significance, I keep it to myself. I was and remain a Dylanist. My musical tastes haven’t changed for many years: I listen to classic rock and blues of the late 60s and early 70s, interspersed with some modern stuff. There’s too much music to get a real grasp of it all without spending a great deal of time. I’m also not so sure that looking for something I’d prefer to Dylan and Waits would be crowned with success. I watch more “television” than cinema, but not on television – internet series. Game of Thrones isn’t that interesting. I really enjoy English and Scandinavian series that aren’t so well known. There are so many series to watch nowadays! I’m really interested in many things, but I couldn’t describe them as life-defining. I’ve got two stable priorities – family and work. I don’t teach anyone. I commentate on chess games on the internet. It’s not that it’s impossible to play at a high level after forty, but… for me personally it’s time to think about what to do when I’ll no longer be able to play like this. It’s clear that it’s possible to organise your life differently: not to start a family, to fully devote yourself to work or, on the contrary, the family. But I’ve never had the desire to blow something up in life, to make a splash, for some revolution that changes everything. Such a tendency isn’t in my character. For such a thought to arise you have to be deeply unhappy with something, and I see nothing of the sort in my life. 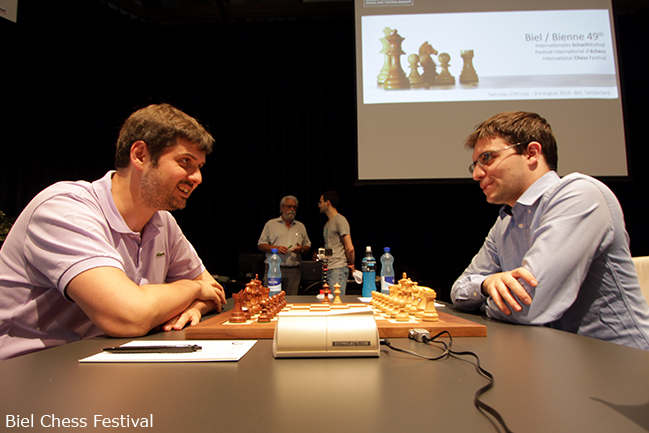 Peter Svidler is playing the live-ranked world no. 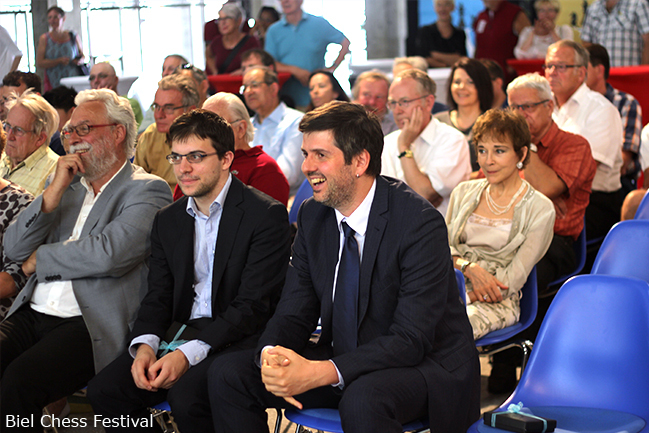 2 Maxime Vachier-Lagrave in a match in Biel. On the rest day the score is 5.5:2.5 in the Frenchman’s favour, but there are still four points up for grabs in the remaining two classical games (each classical game is two points for a win). Follow the match live here on chess24 from 14:00 CEST on Thursday.